The incident took place when the herd of 13 elephants was moving toward a canal road from a nearby paddy field. Seven elephants came in contact with an 11-KV sagging electric wire. Seven elephants died after coming in contact with a sagging electric wire in Odisha's Dhenkanal on Friday. This is the highest casualty of elephants in a single incident in Odisha. A herd of 13 elephants was passing through the village in Sadar Forest Range and seven of them came in contact with an 11-KV line, Assistant Conservator of Forest Jitendranath Das said. 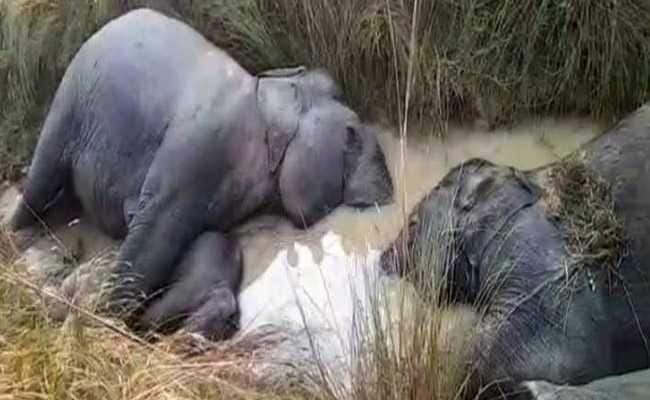 The carcasses of seven pachyderms, including a tusker and five female elephant, were spotted in the morning by villagers who informed forest officials. While three carcasses were lying on a road, four others were inside a canal. The incident took place when the herd was moving toward a canal road from a nearby paddy field. Senior forest officials including Divisional Forest Officer of Dhenkanal Sudarsan Patra and ACF Das rushed to the spot and arrangements were made for shifting the carcasses, said an official. Another official said the forest department had told the energy department to direct the agency concerned to ensure that the electric wire was at a height of 17-18 feet above the ground. The environment ministry data shows that 655 elephant deaths took place in India from 2009 to 2017. This translates into an average of about 80 elephant deaths per year, seven every month and one every four days. The main reasons for elephant deaths are electrocution, train accidents, poaching and poisoning. Rail tracks have also become "death traps" for elephants. In April this year, four elephants including a tusker and a calf were killed in Jharsuguda district when they were hit by a speeding train. Data shows that between 1987 and 2010, 150 elephants have died while just crossing railway tracks. According to wildlife experts, India has the highest number of train accidents involving elephants in the world. They also wrote to Rail Minister Piyush Goyal, urging him to look into the problem, and listed solutions. To reduce the deaths of elephants on the train tracks, Railways has come up with 'Plan Bee'. This innovative method prevents elephants from approaching the railway lines by setting up of devices near tracks. These devices emit the buzzing sound of bees and prevent elephants from approaching the tracks.